I know it's been almost a month since I reviewed my last novel. I have been on summer vacation learning foreign languages, discovering new cities and meeting new people. It's been fun! I just finished this wonderful novel, I so much loved it and it is one of my favourite books. I borrowed it from a MS/HS Library. It is just amazing, this is one of those books I would love to read later in the future. Mark Haddon wrote a very entertaining book here and I am so glad it worn the 2004 Commonwealth Writer's Prize for Best First Book. I know this does not belong to the African Literature genre, but on my search for next novels to read I came across it, seen that it won the Commonwealth Writer's Prize which quite a good number of African Writers have won as well I decided to give it a try and it was more than entertaining. It tells the story of a teenage boy called Christopher, with special needs, (his diagnosis was never mentioned in the book, but after a little research I guess it was Asperger Syndrome), while he was investigating the death of a neighbour's dog, he encountered himself in situations where he has to survive alone and take decisions despite his state of health, these experiences made him believe in himself. This story was told from the voice and the mind of a teenager with an Asperger Syndrome, it is really impossible not to understand what the character was writing about, because this book was written in a very clear and straightforward way, although the Maths problem are a bit difficult to understand from my point of view. This novel could be considered children's fiction but I enjoyed every bit of it and I think any adult would love it too. 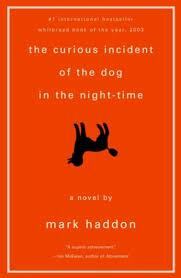 This is a book I highly recommend, thumbs up to Mark Haddon. I also heard that a movie about this book will be out in the cinemas soon, I hope to see it and I also hope that it will do this book justice. Mary, no wonder I hadn't heard or read from you in ages. I hope you had a nice time. This is a fine review and I think I've read another review of the same book on a blog I can't remember. A great book, by all standards and judging from your review too. Welcome back and hope to see you on my blog soon. Reading Pleasure! This is a book I highly recommend you to read. I learnt a lot about life and myself in it. I will visit your blog right away! Cheers. We seem to have similar taste in books. I read this book and enjoyed it tremendously. It's a touching piece that defines what trust is and how easily it can be lost. Nana...I absolutely agree with you.. I read this book while I ate dinner, it was so enjoyable. I am glad you enjoyed it too. Aw! A favourite of mine. Wow! I am nominated for the Booker Award? I'm going to check that out right away.